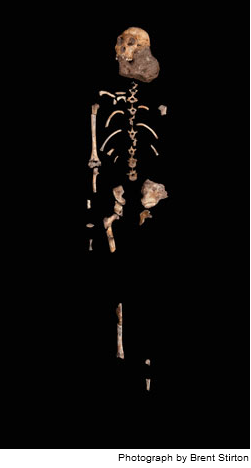 A new ancestor emerges from the richest collection of fossil skeletons ever found. Lee Berger is standing in a death trap, smiling. It is a hole in the ground about 25 miles northwest of Johannesburg, in a ridged brown valley where herds of giraffes occasionally parade between stands of trees. The red-rock walls of the pit are higher than Berger's head, and steep enough in spots to make a scramble up, or down, rather daunting. Some two million years ago, the hole was a great deal deeper, with no possibility of escape for any creature that fell in. This accounts for the trove of fossils Berger is finding, which in turn accounts for his upbeat mood. He leans over a red boulder near the pit bottom, tracing a white-colored protrusion with his fingers. "It looks like part of an arm," he says. "That means we've found another individual." The first two skeletons removed from the pit were a young adolescent male, 12 or 13 years old, and an adult female. Berger, a paleoanthropologist at the University of the Witwatersrand in Johannesburg, and his colleagues made the announcement in April 2010. The site, an eroded limestone cave called Malapa, is in a region already so famous for its ancient human fossils that it is often referred to as the Cradle of Humankind. Much of that reputation rests on finds from the early 1900s, back when South Africa harbored the best evidence for early human evolution, including Australopithecus africanus, at the time our oldest known ancestor. Beginning in the late 1950s, the epochal finds of the Leakey family in Tanzania and Kenya, followed later by Donald Johanson's celebrated discovery of the 3.2-million-year-old Lucy skeleton in Ethiopia, shifted cradle-bragging rights to East Africa, where they have remained ever since. Lee Berger thinks the cradle is about to rock again. He believes Malapa may hold the key to one of the most significant, least understood chapters in the human evolutionary journey: the origin of the first species enough like us to be called human—a member of the genus Homo. "This is where that story may have begun," he says, as he starts the climb out of the pit. At an international gathering of anthropologists in Minneapolis this past April, Berger and his colleagues laid out arguments for why the Malapa species, known as Australopithecus sediba, may represent an intermediate form between the primitive australopiths and our genus, Homo. The evidence they point to includes an australopith's little brain (with some curiously modern features), apelike shoulders, and arms adapted to climbing in trees—attached to a bizarrely modern hand with the precision grip of a toolmaker. According to the researchers, the adult female's foot presents an even odder melange; her mostly modern ankle is connected to a heel bone more primitive than that of A. afarensis—Lucy's species—which is at least a million years older. In a science known for its contentiousness, such a claim will surely not go unchallenged. But no one disputes that the Malapa fossils are unprecedented"It really is a jaw-dropping find," says Carol Ward, a paleoanthropologist at the University of Missouri who studies the evolution of apes and early hominins (a term for humans and other nonape primates; some researchers prefer the older term, hominid). "We have no other collection of fossil skeletons, until the Neanderthals just over 100,000 years ago, that are so articulated, so complete." The abundance and spectacular condition of the fossils have much to do with the peculiar geography of the place. Malapa, it seems, was both a water source that gave life and a trap that snuffed it out. Two million years ago, a cave-studded aquifer lay beneath an undulating plain of shallow, wooded valleys and rolling hills. Some of the caves were open to the surface through steep entryways or vertical shafts stretching up to 160 feet. In wet periods, when the water table was high, animals could easily drink from seepage ponds near the surface. During drier times they would venture into the darkness of a hole, following the sound or scent of water—and risking a plunge down a hidden shaft. (The boy's upper arm bones show fractures typical of a headfirst fall from a great height.) "These animals had no choice. They needed water to survive," says Brian Kuhn, a zoologist from the Johannesburg university—called Wits for short—who works at the Malapa site. After death, their bodies would wash down even deeper in the cave system, becoming entombed within days or weeks in a single, thick layer of sand and clay, rather than a succession of thin layers, as would have happened had the sediments accumulated over months or years. This raises the possibility, says Berger, that all the hominins—at least four are now known from the site—died weeks or even days apart, and therefore may have known each other in life. The rapid burial also caused their flesh to take longer to decompose, packaging the skeletons in death as they were arranged in life, right down to tiny bones of the hands and feet. Indeed, the rapid entombment may have preserved some of the skin itself, on top of the boy's skull and on the woman's jaw near the chin—something never before seen in a hominin fossil. "Wow!" says Nina Jablonski, an anthropologist at Pennsylvania State University and author of the book, Skin: A Natural History. "The possibility of preserved australopithecine skin is massively cool." What makes it so cool is the possibility of determining how these near humans reacted to heat. She is particularly interested in whether the alleged skin (or a fossilized impression of the skin, if that's what it is) might contain evidence of scalp and facial hair, and a high density of sweat glands. Jablonski thinks such glands could be a precondition to the bigger brains long seen as a defining attribute of Homo. Chimpanzees, our closest living relatives, spend most of their time sheltered from the sun's heat by forest cover and have a limited ability to sweat. Our earliest ancestors also typically occupied woodland environments. But as the environment became drier around two million years ago, they began to forage in more-open grasslands—a problem for brains, which are notoriously vulnerable to heat. Bigger brains require even more cooling. A marked increase in the number of sweat glands and a reduction in body hair could have provided that, Jablonski speculates, in turn allowing for further brain growth as Homo began to use those bigger brains for toolmaking, planning, and other cognitively challenging activities. So what about the brain of A. sediba? The question triggers another big grin from Berger. Its size is a chimplike 420 cubic centimeters—not at all unusual for something called Australopithecus. The shape, however, is. Together with Paul Tafforeau at the European Synchrotron Radiation Facility in Grenoble, France, Berger's team produced a series of ultrahigh-resolution images to create a virtual endocast: an impression of the boy's skull showing the general contours of the outer brain layer. "The frontal lobes on the two halves appear to be different sizes," notes Kristian Carlson, a paleoanthropologist at Wits who is reconstructing A. sediba's brain. Pronounced asymmetry between right and left brain hemispheres is a hallmark of humans, because our cerebrum has become specialized, with the left side more involved in language. On that side Carlson sees hints of a protrusion in the region of Broca's area—a part of the brain linked to language processing in modern humans. But Dean Falk from the School for Advanced Research in Santa Fe, an expert on fossil endocasts, adds the caution that Broca's area is defined by specific creases in the brain, and "it would be quite a reach" to identify it based only on a bulge. 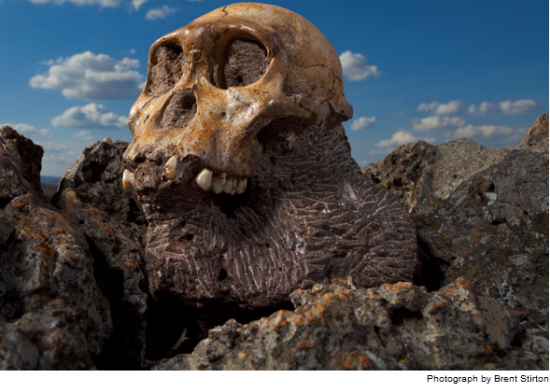 A. sediba's greatest promise may lie in its power to illuminate the murky origins of Homo. The birth of our genus has long been a conundrum for paleoanthropologists, to say the least. Only a few scattered and fragmentary fossils older than two million years have been argued to belong to the genus. Then, around 1.8 million years ago, not one but two or possibly even three Homo species appear, mostly in East Africa. The smaller brained, more primitive ones are called Homo habilis, or "handy man," a name given by Louis Leakey and colleagues in 1964 to specimens from Olduvai Gorge because of their association with the first crude stone tools. Some researchers group a few H. habilis specimens into a separate species, Homo rudolfensis. Then there is Homo erectus (the early African forms are sometimes called Homo ergaster)—larger brained, bigger bodied, more advanced, yet contemporaneous with little H. habilis. Where did all these characters come from? Attempts to look deeper into the past only increase the frustration, says William Kimbel, a paleoanthropologist at Arizona State University and director of the Institute of Human Origins there. "There are only a handful of specimens. You could put them all into a small shoe box and still have room for a good pair of shoes," he says. An upper jaw from Hadar in Ethiopia, found by Kimbel himself, is 2.3 million years old. A lower jaw from Malawi may be 100,000 years older, though the dating is uncertain. Some researchers would include a skull piece from Kenya of about the same age. That's about it. Enter the skeletons of A. sediba—as resplendently well preserved as those shoe box fossils are not. Anatomically, the species shows a mix of primitive and advanced traits. In addition to its long upper limbs, small brains, and primitive heel bone, its small body size and the shape of its molar cusps and cheekbones hark back to earlier australopiths, such as A. africanus, that lived in southern Africa between two and three million years ago. (Indeed, some researchers suggest that it might be a late form of that species.) The long legs and that modern ankle are key elements on the human side of the ledger, says Darryl de Ruiter, a paleoanthropologist at Texas A&M University and part of the Malapa team. He also cites the surprisingly humanlike pelvis built for a fully bipedal stride; smaller teeth and chewing muscles; a projecting nose and some other features of the face; and that remarkable, precision-grip hand. These traits are enough for the team to propose it as the australopith species most likely to have given rise to Homo. But which Homo? The team leans very cautiously toward Homo erectus, the species generally seen as the immediate forerunner of Homo sapiens. If this is so, then the smaller, mostly East African forms now attributed to Homo, including Louis Leakey's original toolmaker H. habilis, would become a branch of the family tree that simply petered out. It is not the first time scientists have suggested these species could be evolutionary dead ends. But the Malapa fossils bring more clout to the debate. "Sediba casts everything called Homo before erectus into question," says de Ruiter. The biggest obstacle facing this challenge to the establishment view is the timing. 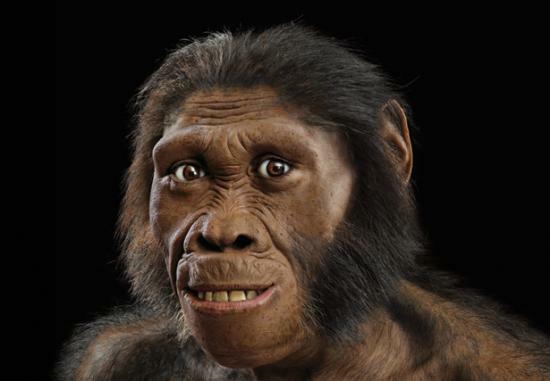 If two-million-year-old A. sediba is indeed the true ancestor of Homo, how could it give rise to those even older fossils assigned to Homo in Bill Kimbel's shoe box? A fossil cannot be ancestral to something older than itself any more than a daughter can give birth to her own mother. One possibility is that the Malapa specimens represent a late stage of an enduring species that gave rise to Homo at an earlier date. But Berger's team questions whether that shoe box really contains any Homo fossils in the first place—after all, they're just fragments. Kimbel doesn't buy it. "It's nonsensical to dismiss fragments, because fragments do tell you something," he says. He points out that the upper jaw from Hadar has a short, broad, humanlike dental arch and flat snout, placing it firmly in the Homo genus—and it is at least 300,000 years older than A. sediba. Berger's team, however, insists that Malapa changes the game. Articulated skeletons are far more than the sum of their parts: They prove that parts in isolation can be misleading. Think of the bits of A. sediba that look primitive, and the other bits that look modern, he says. The Hadar jaw, in the same way, might not accurately represent the rest of the creature. "How can the Hadar jaw be misleading?" says Kimbel. "Either it shares features with later Homo, or it does not. Nothing in sediba can change that." If the Hadar jaw really is Homo, says Berger, then perhaps its dating is wrong—a contention Kimbel disputes as vigorously as he supports the validity of his fossil. The truth about A. sediba's place in our ancestry may still be lying in the ground. "The beauty of a place like Malapa is that there are many more bones, and more individuals to come," Berger says. Ultimately the fossils, not the arguments, will carry the day.